They took away everything she loved ... now, she's out for revenge. Sage Morrow had it all: life on a beautiful Colorado ranch, a husband who adored her, and a baby on the way. Until five ruthless gunmen rode up to their ranch and changed her life forever. Now Sage is a bounty hunter bent on retribution. Accompanied only by her majestic hawk, she travels throughout the Rocky Mountains in search of injustice, determined to stamp it out wherever it's found. The stakes are raised when two young boys are kidnapped and Sage is forced to work with Marshall Parker Timmons to rescue them. But Sage may ultimately get more than she bargained for. In this exciting historical romance set in the late 1800s, murder, intrigue, kidnapping, and questions of faith will keep you in suspense until the final pages. 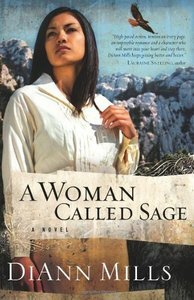 About "The Woman Called Sage"
Award-winning author, DiAnn Mills, has over forty-nine books in print and has sold more than a million and a half copies. She is a finalist for the 2008 Christy Award for her novel, Lightning and Lace. Six of her anthologies have appeared on the CBA Best Seller List. Five of her books have won placements through ACFW's Book of the Year Awards 2003-2007. She is the recipient of the Inspirational Reader's Choice Award for 2005 and 2007. DiAnn and her husband have four adult sons and lives in Houston, Texas.